Newport became the largest town in Jackson County, Arkansas due to another town's refusal of the railroad. Situated along the White River, Jacksonport was originally larger that Newport, but in 1873 Jacksonport’s leaders refused to grant right of way land to the railroad. The track was laid through Newport instead, located only four miles away. As a result of this fateful decision, Newport soon emerged as the commercial center and the largest town in the county, and by 1891, it had become the county seat. Still, Jackson County was a relatively unpopulated rural area, and Newport never became a city of any significant size. In 1910, only 3500 people lived in Newport. Southern Jews have usually been tied only indirectly to agriculture. Most were merchants who sold products to farmers and sometimes purchased their crops to sell on the national market. Jews were economic middlemen who created communities in places that had sufficient economic opportunity. In Jackson County, Arkansas, economic limitations hindered the development of a strong Jewish community. The first significant Jewish community in the area was short-lived and disastrous. In 1883, the group Am Olam (People of the World) established a communal agrarian colony outside of Newport. Formed in Odessa, Russia, in 1881 after a wave of brutal pogroms, Am Olam sought to create a network of Jewish agricultural communes in the United States. Inspired by the socialist movement, the group aimed to reconnect Jews with the land and the moral purity of manual labor. The same ideology later informed the kibbutz movement in Israel. In addition to the Arkansas colony, the group also established communities in Oregon, South Dakota, and New Jersey. 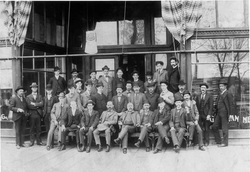 The group came over from Russia in 1882, and spent some time in New York City, gathering money and supplies. In 1883, the group, numbering about 150 people, traveled to Arkansas, where they established the colony. In the Am Olam colony, families lived communally, with women and children sleeping in log shacks and men sleeping on the ground outside. They bought supplies cooperatively. Their plan was to sell wooden staves to a lumber company to support the colony economically. Though the group was not very religious, slaughtering and eating pigs, they did celebrate Passover in 1883. They made their own matzoh but had to use coffee during their seder since they did not have wine. The biblical story of the ten plagues was a harbinger of the upcoming summer as the colony faced a series of hardships, including floods, disease, and unusually hot and humid weather. Yellow fever and malaria swept through the colony, infecting as much as 90% of the residents. About 20 of the settlers died. The stave business failed to produce much income, and the settlers grew increasingly hungry as food supplies became short. After struggling for a year, the remaining members of the colony decided to abandon the settlement. Some of the survivors later established a more successful colony in New Jersey. Although the Am Olam settlement failed, Jewish life in the area continued. Jews had been living in the area around Newport since before the Civil War. Aaron Hirsch had settled in Batesville in neighboring Independence County in the 1850s. He owned one of the largest general stores in the area. Once the railroad was built through Newport, Hirsch moved his store there. By 1873, seven Jewish families lived in Newport. Hirsch became one of the civic leaders of the burgeoning town. In 1879, he donated land for St. Paul’s Episcopal Church. In recognition of this gift, the church inscribed Hirsch’s name on the church’s cornerstone. Hirsch later moved to St. Louis, where he became active in the Jewish community. Aaron’s son Lazar Hirsch came to town with his father in the 1870s. In addition to the family business, Lazar got involved in several other ventures, including a telephone company and an ice-making company. Lazar was also civically involved, serving as city treasurer and deputy sheriff. Another of Aaron Hirsch’s sons, Jacob, came to Newport as well, opening a furnishings store. In 1880, Lazar sold his mercantile store to two young Jewish business partners, Sigmund Wolff and Isaac Goldman. The renamed Wolff-Goldman Mercantile Company became one of the largest stores in the area. Wolff served as president of two different local banks. Following the pattern first set by Aaron Hirsch, after they were financially successful, Goldman and Wolff moved to St. Louis. Wolff’s son Norman remained in Newport to run the family business, until they sold the store in 1927. The small Jewish population of Newport was concentrated in retail trade. They owned dry goods stores, grocery stores, junk businesses, and a hotel. Charles Meyer owned a dry goods store in Newport for 20 years before he moved it to Jonesboro. Sol Heinemann owned a dry goods store by 1900, when he was only 25 years old. Heinemann owned a variety of other businesses, including a cotton brokerage and industrial tugboats on the White River. Jacob Heilegers, Leopold Thalheim, and Jake Lebovitch also owned retail stores in Newport. Jews lived in Newport for several decades until they organized a congregation. In 1905, 15 Jewish families came together to found Congregation Beth El (House of God). Charles Meyer was the first president of the congregation. Originally, they did not hold regular weekly services, meeting on occasional Sundays instead. Rabbi Alfred Godshaw later served the congregation for a brief time. Although their services were in English and likely Reform in style, they never joined the Union of American Hebrew Congregations. The congregation never really grew and it never had a permanent synagogue. Sometime after 1917, Beth El disbanded. The Jewish community of Newport never reached a critical mass of population. In 1917, 35 Jews lived in town. By 1937, only 22 Jews still resided in Newport. By the 1980s, only two Jewish families remained. Though small in number, the Jewish community played an important role in Newport's history.